This article in Logic magazine was brought to my attention by a recent issue of Ian O’Byrne’s excellent TL;DR newsletter. It’s a long read, focusing on the structural power of internet giants such as Amazon, Facebook, and Google. The author, K. Sabeel Rahman, is an assistant professor of law at Brooklyn Law School and a fellow at the Roosevelt Institute. He uses historical analogues to make his points, while noting how different the current state of affairs is from a century ago. As in the Progressive Era, technological revolutions have radically transformed our social, economic, and political life. Technology platforms, big data, AI—these are the modern infrastructures for today’s economy. And yet the question of what to do about technology is fraught, for these technological systems paradoxically evoke both bigness and diffusion: firms like Amazon and Alphabet and Apple are dominant, yet the internet and big data and AI are technologies that are by their very nature diffuse. The problem, however, is not bigness per se. Even for Brandeisians, the central concern was power: the ability to arbitrarily influence the decisions and opportunities available to others. Such unchecked power represented a threat to liberty. Therefore, just as the power of the state had to be tamed through institutional checks and balances, so too did this private power have to be contested—controlled, held to account. This emphasis on power and contestation, rather than literal bigness, helps clarify the ways in which technology’s particular relationship to scale poses a challenge to ideals of democracy, liberty, equality—and what to do about it. I think this is the thing that concerns me most. Just as the banks were ‘too big to fail’ during the economic crisis and had to be bailed out by the taxpayer, so huge technology companies are increasingly playing that kind of role elsewhere in our society. The problem of scale, then, has always been a problem of power and contestability. In both our political and our economic life, arbitrary power is a threat to liberty. The remedy is the institutionalization of checks and balances. But where political checks and balances take a common set of forms—elections, the separation of powers—checks and balances for private corporate power have proven trickier to implement. These various mechanisms—regulatory oversight, antitrust laws, corporate governance, and the countervailing power of organized labor— together helped create a relatively tame, and economically dynamic, twentieth-century economy. But today, as technology creates new kinds of power and new kinds of scale, new variations on these strategies may be needed. “Arbitrary power is a threat to liberty.” Absolutely, no matter whether the company holding that power has been problematic in the past, has a slogan promising not to do anything wrong, or is well-liked by the public. We need more than regulatory oversight of such organisations because of how insidious their power can be — much like the image of Luks’ octopus that accompanies this and the original post. First, there is transmission power. This is the ability of a firm to control the flow of data or goods. Take Amazon: as a shipping and logistics infrastructure, it can be seen as directly analogous to the railroads of the nineteenth century, which enjoyed monopolized mastery over the circulation of people, information, and commodities. Amazon provides the literal conduits for commerce. A second type of power arises from what we might think of as a gatekeeping power. Here, the issue is not necessarily that the firm controls the entire infrastructure of transmission, but rather that the firm controls the gateway to an otherwise decentralized and diffuse landscape. This is one way to understand the Facebook News Feed, or Google Search. Google Search does not literally own and control the entire internet. But it is increasingly true that for most users, access to the internet is mediated through the gateway of Google Search or YouTube’s suggested videos. By controlling the point of entry, Google exercises outsized influence on the kinds of information and commerce that users can ultimately access—a form of control without complete ownership. A third kind of power is scoring power, exercised by ratings systems, indices, and ranking databases. Increasingly, many business and public policy decisions are based on big data-enabled scoring systems. Thus employers will screen potential applicants for the likelihood that they may quit, be a problematic employee, or participate in criminal activity. Or judges will use predictive risk assessments to inform sentencing and bail decisions. These scoring systems may seem objective and neutral, but they are built on data and analytics that bake into them existing patterns of racial, gender, and economic bias. Each of these forms of power is infrastructural. Their impact grows as more and more goods and services are built atop a particular platform. They are also more subtle than explicit control: each of these types of power enable a firm to exercise tremendous influence over what might otherwise look like a decentralized and diffused system. As I quote Adam Greenfield as saying in Microcast #021 (supporters only!) this infrastructural power is less obvious because of the immateriality of the world controlled by internet giants. We need more than managerial approaches to solving the problems faced by their power. 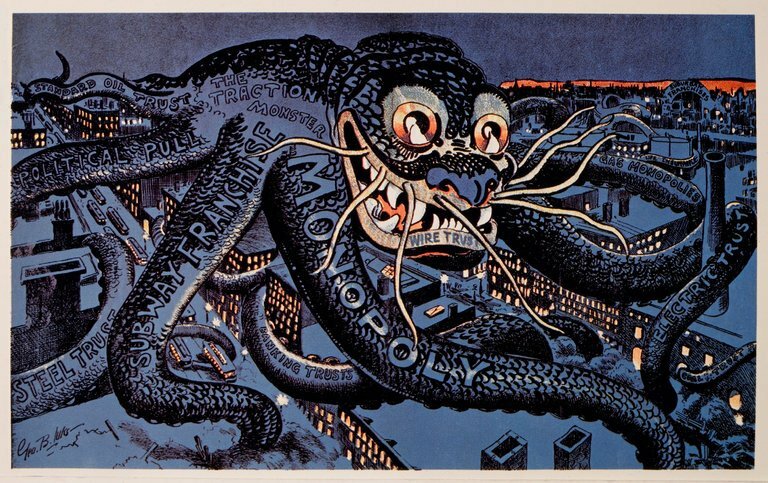 A more radical response, then, would be to impose structural restraints: limits on the structure of technology firms, their powers, and their business models, to forestall the dynamics that lead to the most troubling forms of infrastructural power in the first place. One solution would be to convert some of these infrastructures into “public options”—publicly managed alternatives to private provision. Run by the state, these public versions could operate on equitable, inclusive, and nondiscriminatory principles. Public provision of these infrastructures would subject them to legal requirements for equal service and due process. Furthermore, supplying a public option would put competitive pressures on private providers. We can also introduce structural limits on technologies with the goal of precluding dangerous concentrations of power. While much of the debate over big data and privacy has tended to emphasize the concerns of individuals, we might view a robust privacy regime as a kind of structural limit: if firms are precluded from collecting or using certain types of data, that limits the kinds of power they can exercise. Some of this is already happening, thankfully, through structural limitations such as GDPR. I hope this is the first step in a more coordinated response to internet giants who increasingly have more impact on the day-to-day lives of citizens than their governments. Moving fast and breaking things is inevitable in moments of change. The issue is which things we are willing to break—and how broken we are willing to let them become. Moving fast may not be worth it if it means breaking the things upon which democracy depends. It’s a difficult balance. However, just as GDPR has put in place mechanisms to prevent the over-reaching of governments and of companies, I think we could think differently about perhaps organisations with non-profit status and community ownership that could provide some of the infrastructure being built by shareholder-owned organisations. Having just finished reading Utopia for Realists, I definitely think the left needs to think bigger than it’s currently doing, and really push that Overton window.